and fell in love at a cancer support group. Based on the best-selling novel by John Green, The Fault in Our Stars takes us inside the lives of two teenagers who meet at a cancer support group and quickly fall in love. As they strive to live life knowing that their ends are never far away, they redeem their opportunities to get the most out of their experiences together. Many will find themselves surprised at just how much narrative detail is packed into every segment of this incredible story. This is one of the most ferocious tear-jerkers in recent years with a tendency to lead us in and out of "cry here" moments—moments that nevertheless don't lose much, if any, impact as we go in knowing what we are in for. All performances are unexpectedly top-notch with Shailene Woodley's touching Oscar-level. Her dedication to her role as a girl more emotionally mature and stronger than her fellow sufferers is not only impressive, but unshakeable long after the movie has ended. It remains the case, however, that some of this could have been abbreviated; in consideration of the project's meaty 2+ hour runtime, (which exhausts our tear duct capacity at around two-thirds of the way in) the last chunk of the film keeps experimenting with stretched out sequences of wordy narrative dialog that takes viewers out of their headspace and into a sappy and overly morose, pseudo-poetic fixation on death and grief. It feels manipulative at that point and doesn't lead out gracefully enough to come to a proper, more dignified ending. 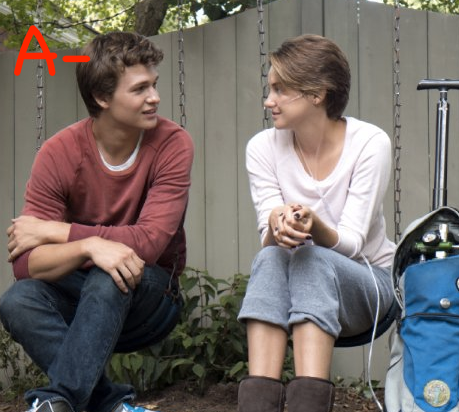 Most justifiably, The Fault in Our Stars has been – and will remain – one of the most talked about movies this year.